Dobies own selection of these stunning flowers. Grow these statuesque beauties and you will see the reason for the name – they do resemble dahlias. 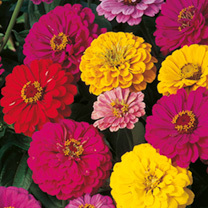 Plants produce enormous blooms in a wide array of colours. For borders or cut flowers. RHS Perfect For Pollinators. Height 60cm (2'). HA/HHA - Hardy annual/Half-hardy annual. Start the seed inside for early flowering, but zinnias often do well sown direct outside as they dislike root disturbance. Sow March-May to flower July-September. Suggested planting distance 23-30cm (9-12"). Ideal for beds and borders. Suitable for cutting. Prefers full sun.